+ Producing and mixing music at home? Check out Soundfly’s brand new mentored online course, Songwriting for Producers, to take all those unfinished ideas and transform them into fully fleshed out, compelling songs! Free preview here. This article originally appeared on Ritwik Deshpande’s blog, Mutationist. I attended a talk by Ivy Ross, the head of design for all hardware products at Google. Ross started her career as a jewelry designer, and when she was 24, had some of her work acquired by The Smithsonian. “The ego trip lasted for all of three weeks,” she said. The success was great, but transient. The process of making those pieces, in comparison, took way longer. What she learned from the experience was that you spend more time doing the work than experiencing its outcome. It’s better to make that time worthwhile than to worry about how the work will land. I recently finished a song, played it back, and felt very excited. It was the most evolved piece of music I had composed so far. The sounds worked well with each other, the mix sounded clean, and the composition had a well-defined narrative arc. I played it to a few friends and co-workers and felt delighted as I watched them move (just a little) at parts where the momentum picked up. It felt like the months of practice were finally beginning to pay off. Then, after a day, I revisited the song and realized the melody was cheesy, the synth sounds were plain, and the whole thing felt, well, unmemorable. It was a good track in a utilitarian sense — it had all the necessary musical components arranged in a sensible way, but nothing about it would someone make dance uncontrollably in the middle of the street. Even though the track was a marker of progress, it was far from transcendent. Even though music is my hobby and I don’t have any aspirations to “make it in the industry,” per se, it’s hard not to have dreams for how I want my music to sound and what kind of reactions I want it to invoke. I’d be lying if I said I don’t periodically imagine crowds of people losing it to something I’ve composed. As a result, while producing music, I often get stressed about doing things the “right way.” I get so focused on the outcome that I begin to drift away from what I’m feeling in the present moment. Ross’ talk made me realize that the present moment is more important than anything else. 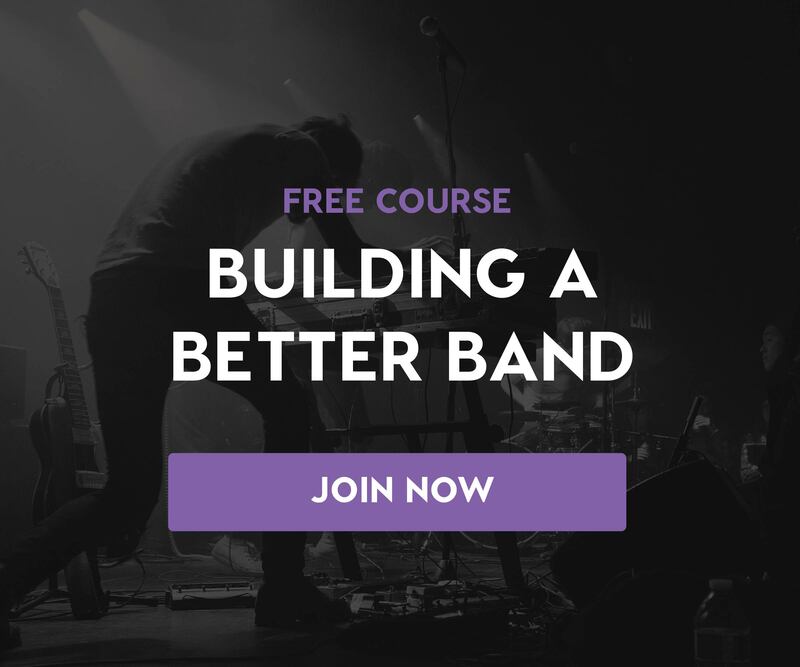 + With Soundfly’s mentored online course program, you can learn online from anywhere, and you’ll get weekly coaching, support and feedback on your work from a professional in the field who’s invested in helping you reach your musical goals! This is something I was beginning to forget. While working on the last few tracks, I was worried that my music didn’t have enough micro-moments to stay interesting (micro-moments being my way of referring to layers of small, often percussive sounds that add texture, variation, and movement — Nicolas Jaar’s “Don’t Break My Love” and Ross from Friends’ “Talk to Me You’ll Understand” have a lot of good ones). I spent a ton of time pulling in samples one by one, processing them, cutting them up, and arranging them in time with everything else. This process was arduous and ultimately ineffective. I would make an edit, play the beat back from the beginning, and realize it was a little ways off. I would move the sample just a little, tweak some more parameters, play the beat again, and notice something else about it that didn’t work. I spent a few hours doing this and ultimately didn’t end up using any of it. The results weren’t worthwhile; the process felt like a chore; and I accepted the fact that the idea I was trying to develop didn’t need these micro-moments in order to work. It was just a requirement I had imposed on myself for no specific reason. I don’t regret going down this path. Putting myself through it gave me a sense of what doesn’t work. I was trying to design sounds and compose at the same time. It also provided a few ideas on how I could create a more fun approach to putting together micro-moments. I could spend an evening messing with samples, creating a ton of random, weird sounds, and loading them up into a drum rack. Then, I could play the core beat and trigger the samples live, leading with feel and intuition as opposed to obsessive tinkering. Success and failure are transient, and we’re constantly oscillating between both states. There is no guarantee that if you suffer, you’ll succeed. Likewise, having a good time is not a hard prerequisite for failure. The results of our efforts are often shaped by forces beyond our control — all we can do is not get too carried away when things are working and not get too crushed when things aren’t. More of our time is spent doing the work than reacting to the results anyway. It’s super important to set things up in a way that the core work remains fun and interesting. Creativity is built on magical, spur-of-the-moment events, but you need to create the right conditions (both external and internal) for it to happen. You need to be in a non-judgemental state of mind, and you need to set your equipment up in such a way that you can get up and running as soon as an idea arrives. How you do it depends on how your mind and body work. The more you put yourself through this process, the more you’ll understand, and the better you’ll get. + Invest in yourself with an online course. All of Soundfly’s mentored online courses come with six weeks of 1-on-1 professional coaching and feedback on your work. It’s like having a personal trainer, but for music! Whether you’re interested in taking a deep deep into production-related topics like Advanced Mix Techniques, Intro to Making Music in Logic Pro X, and Songwriting for Producers, or just want to work with a Mentor directly on a personal project, we can help you reach your musical goals! Ritwik Deshpande is an interaction designer and music student working at the intersection of education and immersive computing. He recently launched a project challenge to create 100 new electronic music tracks, you can follow his progress on SoundCloud. Soundfly welcomes new voices each month to offer unique perspectives, shine a light on unexpected musical worlds, and help our readers find their sound. If you'd like to join us with a guest post, please send articles and inquiries to support(at)soundfly.com!